Those great sages who were taking food according to rules were shining with auspiciousness and their hermitages were shining like the abode of Brahma and filled with sound of chanting of Vedas. This is the end of the first chapter Of the book of Aranya (Forest) of the holy Ramayana composed by Valmiki as the first epic. This is the end of the second chapter Of the book of Aranya (Forest) of the holy Ramayana composed by Valmiki as the first epic. This is the end of the third chapter Of the book of Aranya (Forest) of the holy Ramayana composed by Valmiki as the first epic. Viradha himself wanted to die at the hands of Rama in a true manner with force and he himself revealed to those people who were wandering in the forest that he could not be killed by any weapons. This is the end of the fourth chapter Of the book of Aranya (Forest) of the holy Ramayana composed by Valmiki as the first epic. He saw that Chariot was standing in space and was yoked to horses of green colour , which was shining like a young sun , which was similar to dense white clouds and which was similar to the moon. When Indra was seen to be talking with sage Sarabhanga , noticing Indra , Rama told to Lakshmana. This is the end of the fifth chapter Of the book of Aranya (Forest) of the holy Ramayana composed by Valmiki as the first epic. This is the end of the sixth chapter Of the book of Aranya (Forest) of the holy Ramayana composed by Valmiki as the first epic. This is the end of the seventh chapter Of the book of Aranya (Forest) of the holy Ramayana composed by Valmiki as the first epic. This is the end of the eighth chapter Of the book of Aranya (Forest) of the holy Ramayana composed by Valmiki as the first epic. This is the end of the ninth chapter Of the book of Aranya (Forest) of the holy Ramayana composed by Valmiki as the first epic. This is the end of the tenth chapter Of the book of Aranya (Forest) of the holy Ramayana composed by Valmiki as the first epic. When he was talking like this , he saw a group of hermitages circled by cloth made of grass , which was encompassed by solemn chant of Veda and Rama entered in to it along with Lakshmana and Vaidehi. Seeing the pretty forests , cloud like mountains, lakes, rivers and walking along the pathway as per the advice of Sutheeshna travelled comfortably and told Lakshmana the following with great joy. When Rama completed his narration to Lakshmana , the sun went down and the dusk was initiated. This is the end of the eleventh chapter Of the book of Aranya (Forest) of the holy Ramayana composed by Valmiki as the first epic. That dear disciple of Agasthya speedily approached sage , saluted him and told the sage who has done very difficult penance , and told him exactly similar to what Lakshmana told that Rama has come. 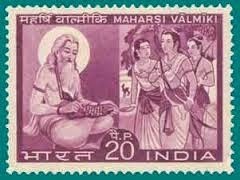 This is the end of the twelfth chapter Of the book of Aranya (Forest) of the holy Ramayana composed by Valmiki as the first epic. This is the end of the thirteenth chapter Of the book of Aranya (Forest) of the holy Ramayana composed by Valmiki as the first epic. Then Rama taking Sita , the princess of Mithila along with the very powerful bird went to Panchavati in the company of Lakshmana with a view to destroy the enemies like fire destroys the butterflies. This is the end of the fourteenth chapter Of the book of Aranya (Forest) of the holy Ramayana composed by Valmiki as the first epic. This is the end of the fifteenth chapter Of the book of Aranya (Forest) of the holy Ramayana composed by Valmiki as the first epic. Along with Sita , the valorous son of Sumithra holding the water pot went slightly bent and he told. This is the end of the sixteenth chapter Of the book of Aranya (Forest) of the holy Ramayana composed by Valmiki as the first epic.